Great News! 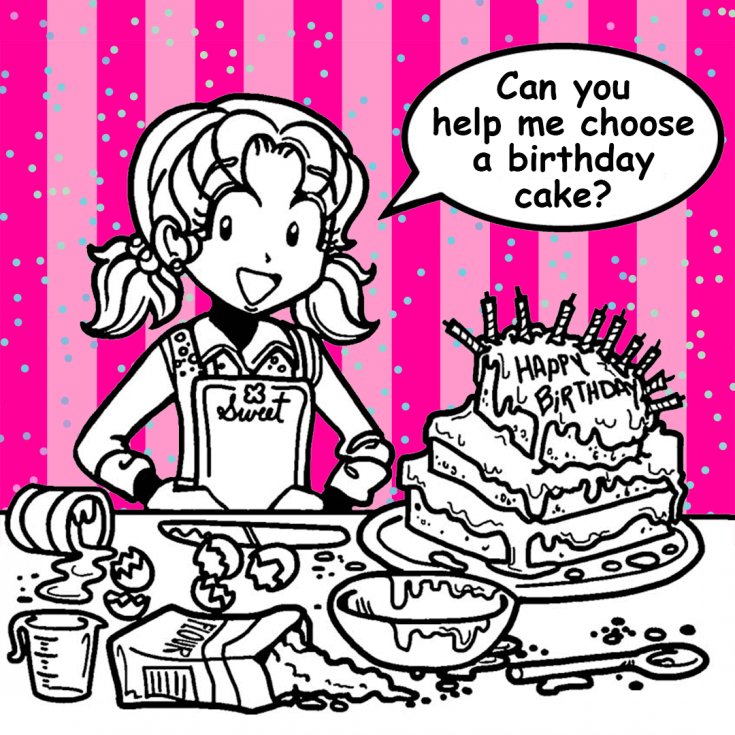 My new Dork Diaries Book 13: Tales From A Not-So-Happy Birthday will be released on Tuesday, October 16th. It’s all of the deets and never-ending DRAMA about my birthday party! You can read a SNEAK PEEK of the book here! I didn’t know that planning a party was SO complicated! Like, for example, choosing the PERFECT birthday cake. Since Zoey is really into unicorns, she suggested a unicorn cake. Chloe is crazy about rainbows, so she urged me to get a rainbow cake. Brandon is an animal lover, so, of course, he recommended an animal print cake. MacKenzie is addicted to lip gloss, so she insisted on a make-up cake. And, Brianna TOTALLY freaked me out when she showed me the cakes she had decorated all by herself :-(! I even thought about making my OWN birthday cake, but I knew THAT could turn into a complete DISASTER! Hey, I can barely cook toast without burning it to a crisp. Anyway, after we got into a heated debate about which cake to get, I suggested that we vote on our favorites and then I’ll make my final decision. So, I really need your help with this. I would appreciate it if you guys would look at all of the cakes we suggested and then vote on YOUR favorites. The cake that gets the MOST votes will be the one I’ll get for my birthday party! You can see pictures of all of the fabulous, yummy-looking cakes and vote on them below. I’d love to hear your thoughts! Which cake do you like MOST and LEAST? What type of cake did you have for YOUR last birthday? Please respond in the comments section. Nikki please use your 4th artsy cake! I LOVE Brandon’s birthday cakes and Nikki’s artsy birthday cakes! I want one like these for MY birthday! That Sponge Bob cake is going to give me nightmares! I know cake of wrath! I think the best cake group is all of Nikki’s cakes! THE LAST FOUR CAKES WHERE NOT THAT PRETTY AT ALL I’M SO SORRY FOR WHO EVER MAKE IT. Now I’m hungry from looking at those cakes! I feel like eating all of them. I really like Chloe’s rainbow cake 3 because it looks delicious and I agree that Brianna’s cakes are horrible! They give me the creeps. Your books are amazing! How long does it take for you to write a book?Are you wondering what does gork mean ? It means geek mixed with dork. DORKS RULE!!!!! I love Nikki’s artsy cake 4! OMG, Brianna’s cakes look horrible. Hey, I don’t want to be rude, but her cakes just look horrible!! All cakes look delicious! Except, Brianna’s OMG cakes. I love Zoey’s unicorn cake 1 and Nikki’s artsy cake 4! !